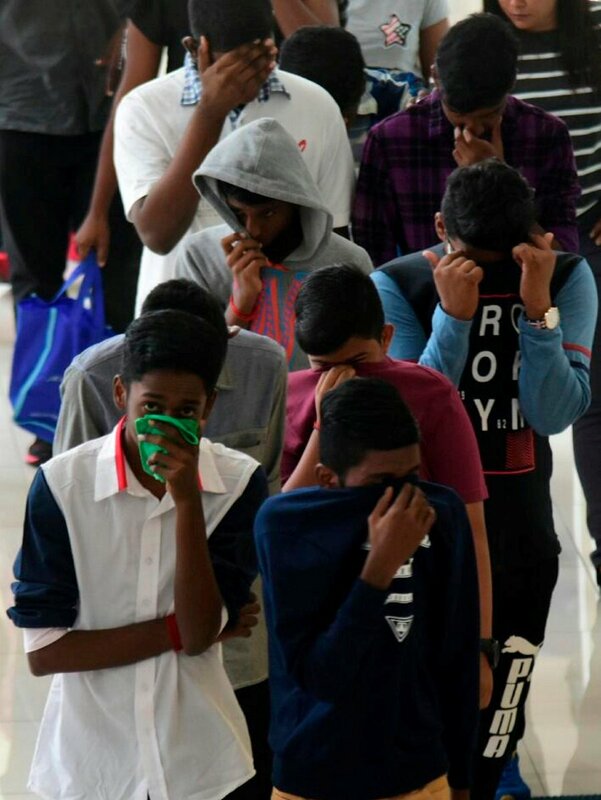 A total of 52 teenagers, aged between 15 and 18, were charged at the Klang magistrate's court here, this morning with participating in unlawful assemblies in front of four schools in the district on April 20 and 21. KLANG: A total of 52 teenagers, aged between 15 and 18, were charged at the Klang magistrate's court here, this morning with participating in unlawful assemblies in front of four schools in the district on April 20 and 21. The accused; 42 of whom are school students, nine school dropouts and a college student, were charged in front of Magistrate Nor Asma Ahmad under Section 143 of the Penal Code. The offence carries a maximum of six-month jail, or fine, or both if found guilty. Only one of the accused - VT Ashwin, from Taman Sentosa, Klang was tried as an adult while the rest were tried as children under the Child Act 2001. According to facts of the case, the teenagers were accused of participating in unlawful assemblies in front of SMK Sri Andalas about 12.30pm on April 20, and in front of SMK Raja Mahadi, SMK Simpang Lima, and SMK Kampung Jawa between 12.40pm and 1.15pm on April 21. They were accused to have committed the offence as depicted in videos of cake cutting ceremonies, where the cakes used were decorated with number '24'. Deputy Public Prosecutor Syed Farid Syed Ali said only three of the accused, who were not represented, pleaded guilty while the rest claimed trial. Nor Asma set this July 6 for the case to be mentioned and for sentencing of those who pleaded guilty, pending behavioral report from the Welfare Department. Among the defence lawyers present were Dev Anand who represented eight of the accused, Dinesh Muthal and V. Muniandy (represented five accused), and Gerard Lazarul (represented 17 accused). It was reported that police had arrested a total of 53 people, many of whom are school students, following incidents where groups of teenagers created havoc in front of the schools. Two videos of the incidents had gone viral on social media, showing the teenagers, whom police suspected of having affiliation with Gang 24 secret society, disrupted peace in front of schools while they were celebrating an occassion by cutting cake bearing digits '24'. I still don't get that Why Students Plagiarize Papers? I mean these papers are what defines you and you still copy someone else's hardwork. This needs to be stopped and we need to do something about it. Advocaat Verkeersrecht gezocht? Dullaers Advocaten is de referentie voor problemen met en adequate oplossingen omtrent Verkeersrecht in Limburg. Here is deep description about the article matter which helped me more. [url="https://www.eurostaryurtdisiegitim.net/yurtdisinda-universite/belarus/belarus-telefon-kodu/"] 232 telefon kodu [/url] I feel very grateful that I read this. It is very helpful and very informative and I really learned a lot from it. Here is deep description about the article matter which helped me more. 232 telefon kodu I feel very grateful that I read this. It is very helpful and very informative and I really learned a lot from it. the best gold detector A responsibility of gratefulness is all together for the post and mind blowing tips. It's lighting up and you're on a strikingly key estimation no nonappearance of check no two ways about it fit around there. This is an amazing on the web journal territory. This kind of anchor-roku private channels 2019 imperative for me and looking at to coordinate. We are fantastically thankful for your blog portion. A responsibility of appreciation is all together for the offer.. Grateful to you for posting such a 예스카지노 article. I found your site perfect for my necessities. It contains phenomenal and steady posts. Your post is extraordinary and illuminating. You have truly shared an obliging and pasaport kaç günde çıkar ekşi on the web journal segment. Much gratefulness to you for sharing this article. I should need to get more posts. This is a phenomenal moving article. This kind of information incredibly 우리카지노 for me and taking a gander at to major. I am essentially content with your unprecedented work. You put incredibly fulfilling information. Expecting to exploring your next post.